Hey peeps! Today is the first day of October, so we’re breaking out the pumpkin recipes!! We’ve got a bit of an obsession with all things autumn/fall-related to be honest. 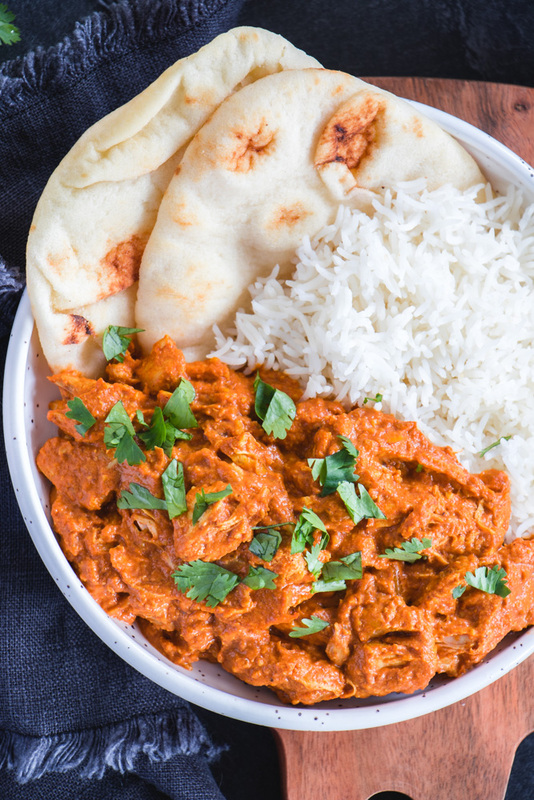 So, we’re sharing two pretty similar recipes for this Pumpkin Butter Chicken Curry today. Why two recipes if they are similar? 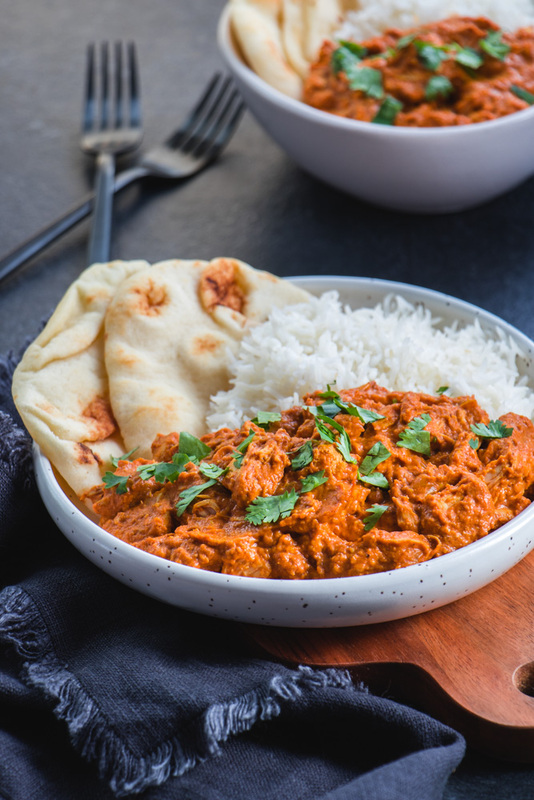 Well, because one recipe uses a premade curry paste, which isn’t always available, and the other uses dry spices many people already own, so is slightly more economical as well! The dry spice mix turned out to have more heat than the pre-made curry paste, which was very similar to a regular/mild butter chicken. However, the flavour of both dishes was really good! If you decide to make the dry spice one but prefer less heat, you can reduce the cayenne by half or add more pumpkin (we are always on board for more pumpkin!) They also looked identical, so we only took pictures of one. I honestly don’t even know which one we photographed! But seriously it doesn’t matter, they both looked like curry. Yeah, so pumpkin recipes are all over the place this time of year, but we are fully on board with being a bit “basic” here. Pumpkin is awesome. It’s full of fibre and vitamin A, so it keeps you feeling full and makes your skin glow. Win-win. Also, if you make your own it’s very economical. One pumpkin costs what? $5? And you can get cups upon cups of puree from one, not to mention pumpkin seeds for roasting! We cook our puree in the microwave – good method for procrastinators like ourselves who don’t always plan ahead. While fresh always tastes best, we used canned pumpkin this time around, since it’s so convenient! We made our pumpkin butter chicken in the slowcooker so that the meat was falling apart and delicious. There is about a half hour of prep beforehand, because slow cookers tend to dull the flavours of things, and we didn’t want that. So, we took a few extra steps. First, we fried the onions and spices together for a few minutes in butter to give a warm, toasty flavour. Second, we marinated the chicken in a yogurt/spice mixture, then browned the chicken in the spice pan before adding it all to the slowcooker. The longer you marinate the better, overnight is best, but 15-20 works too! Yes, it’s a bit more effort than a regular slowcooker dish, but trust us, the extra effort is worth it for the flavour payoff. Also, it’s really only the same amount of work as making it on the stovetop except once it’s in the slowcooker, you are free to come and go as you wish. Both recipes are below – Let us know what you think in the comments! Oh and we preferred using chicken thighs, but the breasts work just as well! 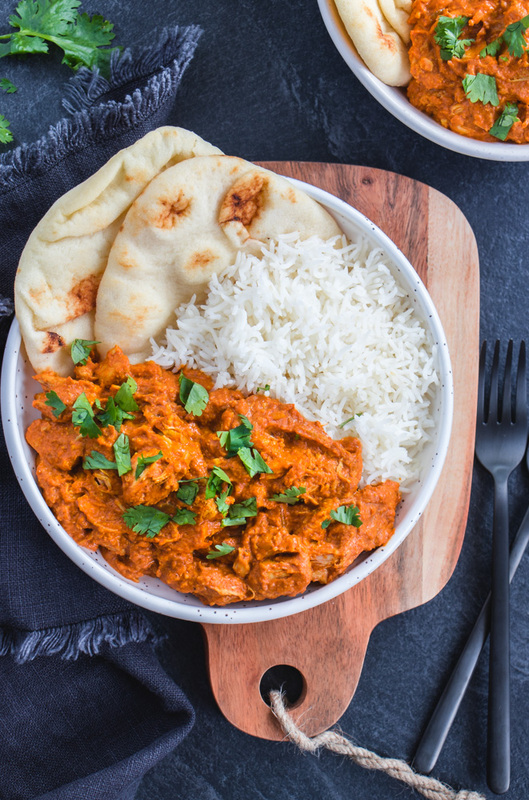 A healthier version of butter chicken, with the addition of a fall favourite – Pumpkin! Mix together marinade and place in a bowl for at least 15 minutes. For best results do the night before, cover and refrigerate overnight. While chicken is marinating, chop the onion and fry with 2 tbsp butter over medium heat for 3 minutes, before adding the garlic, ginger, and spices and cooking for 1 minute. Transfer onion mixture to slow cooker, add remaining ingredients EXCEPT cream, and stir to combine. Fry chicken for 3 minutes over high heat in the same pan as you cooked the onion, and then add to the slow cooker. Cook on low for 4-6 hours or high for 2-3. Check at the halfway mark and add 1/4 cup of water if getting too dry. Turn off the heat once the chicken is cooked and remove insert from cooker. Stir in ½ cup of cream and serve with rice, naan and cilantro, if desired. 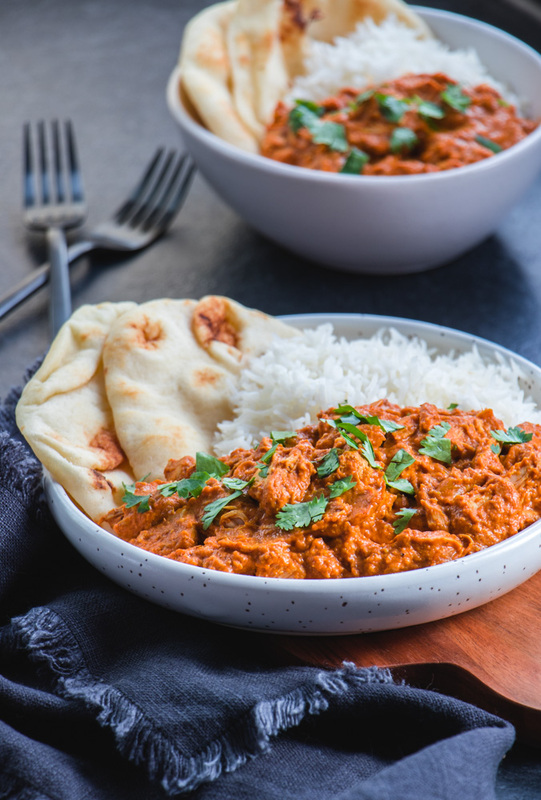 Slightly sweeter and less spicy than the dry spice version, this butter chicken is fantastic and you’d never know there was pumpkin in it! While chicken is marinating, chop the onion and fry with 2 tbsp butter over medium heat for 3 minutes, before adding the garlic, ginger, and curry paste and cooking for 1 minute. Transfer onion mixture to slow cooker, add remaining ingredients EXCEPT cream, and stir to combine. Fry chicken for 3 minutes over high heat in the same pan as you cooked the onion, and then add to the slow cooker. Cook on low for 4-6 hours or high for 2-3. Check at the halfway mark and add 1/4 cup water if getting too dry.